Our blog will be turning 1 month this September 18, 2012 and It's great to throw some giveaways. This is an individual blog and all the things we posted are at our own costs. We are very much happy for the positive response and we are hoping to do this more often since we have regular day jobs. For us, the greatest way to share is when you have just enough and you still love to share it. Hope you love the giveaways!Start your entries now! Let us not forget to thank God for the blessings! 1. FOLLOW MY BLOG THRU GFC. Click "Join This Site" at the upper right of the side bar. 3. POST A STATUS ON FACEBOOK. "Let's join BEAUTYAMARE'S 1ST MONTH GIVEAWAYS! http://www.beautyamare.com/search/label/Giveaways @friend1 @friend2 @friend3 "
MAKE SURE TO TAG MY PAGE as well!And also make sure that it is posted PUBLICLY. 4. FOLLOW @beautyamare on TWITTER. 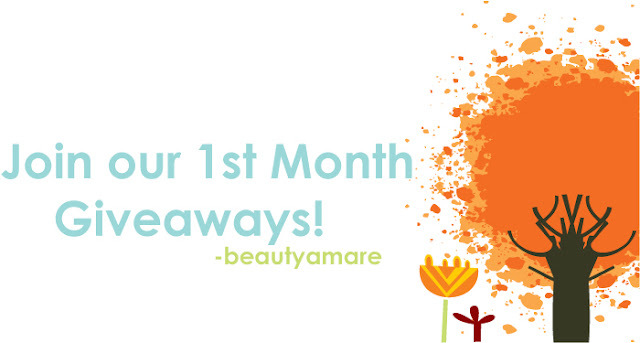 "Let us join @beautyamare on her 1st Month's Giveaway! @friend1 @friend2 @friend3"
TAG ME and 3 of your TWITTER friends. Comment below your Nickname, FB name, GFC name, Twitter username and your preffered package! NOTE: If you are 18yrs old and below, please ask permission from your parents because you'll be giving me your complete address once you won the giveaway! Don't forget to read the Terms and Conditions. Starts today. Ends on the 14th and will be delivered by last week of October or 1st week of November. SPECIAL PRICE: Premium Dress by Tracyeinny . Please note that this size is UK6-8 only. NOTE: SINCE THESE ITEMS ARE FROM SINGAPORE, WE CAN DELIVER THESE TO YOU BY END OF OCTOBER OR 1ST WEEK OF NOVEMBER. WE WILL KEEP YOU POSTED. Package 2 lang ako. Haha.